The week to week lease agreement is for a tenant and landlord that commit to seven (7) days for tenancy. Once this type of arrangement has been setup, it may only be cancelled by notice that is written in the agreement or that is legislated by the respective State laws. The landlord is always recommended to require a rental application before accepting any new lessee. What is a Weekly Rental Agreement? A weekly rental agreement is a contact between you and your guests. It covers your duties and responsibilities as well as the duties and responsibilities of your guests. It will detail everything from the cost of the rental to how many guests are allowed to stay overnight. Most importantly, a good weekly rental agreement will explain the consequences if your renters fail to keep their part of the bargain. A weekly rental agreement can give you the legal right to terminate a booking and to recover your costs for repairs. Without a weekly rental agreement you could be stuck with bad renters on your property for the entire length of the booking, or even having to pay the when you kick them out early. A weekly rental agreement is the best way to give you the flexibility you need to fairly rent out your property for short-term bookings while also being able to protect your investment in your property. 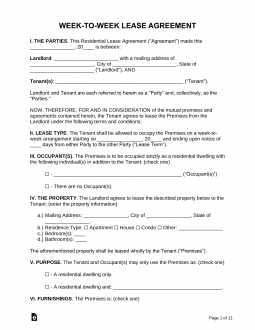 Whenever you are renting out your property to anyone, you should have some type of written agreement in place. If you are renting out the property for a few days, you will want a vacation rental agreement. If you are renting your property on a permanent basis, you will want a month-to-month residential lease agreement. But, if you are renting your property a week or two at a time you will want a weekly rental agreement. This allows you to extend the booking a week at a time, but it also allows you to end a booking at any time should your renters decide to break the terms of the agreement. Weekly rental agreements should be used even if you are using a third-party website like Airbnb or HomeAway to help you find bookings. Most of these sites encourage you to have your own weekly rental agreement and make it possible for you to get guests to sign your agreement as part of the booking process. A weekly rental agreement should also be used even if you know your guests. It may seem awkward to have friends or family sign an agreement, but having the expectations in writing is a good way to avoid a misunderstanding. You should have a standard weekly rental agreement that you use every time. You need to make sure guests sign the agreement before they get the keys to the property. You can email the agreement or upload it to your online booking portal. You can even meet your guests outside the property and have them sign in person before handing over they keys. You should make sure that your guests know they are required to sign a weekly rental agreement. Nobody likes to be surprised with legal documents. You also should make sure both you and your renters have a signed copy of the agreement. Having a weekly rental agreement will give the peace of mind and legal protection you need to keep renting out your property week after week.